Whilst we haven’t seen much of the sun this August, we’ve remained extremely busy particulary with our all weather outdoor living solutions that enable you to enjoy your terrace in a pleasant environment whatever the weather. We have been working around the clock to transform numerous terraces all over the country. It has been a challenge particulary because of the poor weather but our experienced installation crews have successfully completed all installations on time and to the high standards our customers expect. Over in Cambridge our clients wanted to enhance their outdoor living lifestyle by creating an extension to their single storey new build bungalow. 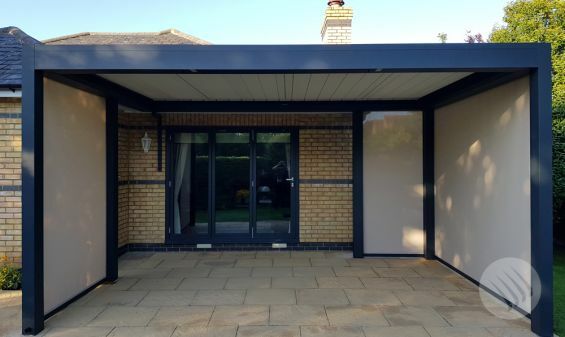 The patio area at the back of their home was once a bare unused space but now after the installation of our Award Winning Deluxe Outdoor Living Pod™ they can now use the terrace all year round. 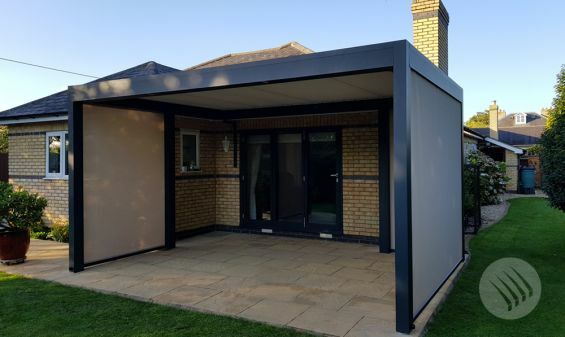 As with all our external shading systems our Outdoor Living Pods are bespoke made to each clients requirements and for their application, no two installations are the same. 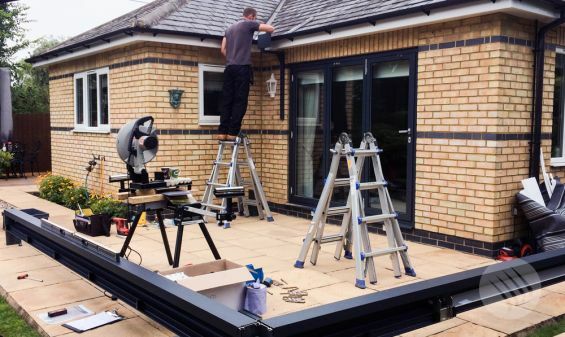 When installing a structure against a part of the property which steps out, it is beneficial to avoid a rear upright as this takes up valuable space. When faced with a single storey building where the structure to ensure a sensible roof height needs to be installed in front of the guttering, its not possible to load the rear beam off the fascia/gutter due to the weight of the system, however, at Caribbean we create our own brackets to overcome what our competitors cannot. This particular installation uses a bespoke designed cantilever bracket to support the rear left corner. The bracket which has a 1m high arm attaches to the brickwork using an epoxy resin & stud combination, spreading the load and weight down the property. It then wraps under and around up in front of the gutter supporting a concealed bracket that the cross beam of the Pod hooks onto. This all means no rear upright in the corner of the terrace which would have looked awkward and taken up the corner space which can now be used for an outdoor fridge. Additionally where the Pod projects beyond the front and side edge of the property thanks to its modular design we have inserted additional uprights to facilitate integrated screens providing low level sun shade along with protection against driving wind and rain. If you want to find out more about how we can integrate our solutions into your patio or terrace give us a call on 0344 800 1947 or send us an email to info@cbsolarshading.co.uk with a photo and some measurements of your outdoor space and we will provide you with our recommendations.